Sensor open The water valve opening is controlled manually. The air conditioning is controlled manually. Sensor short-circuited The water valve opening is controlled manually. Sensor shortcircuited The water valve opening is controlled manually. 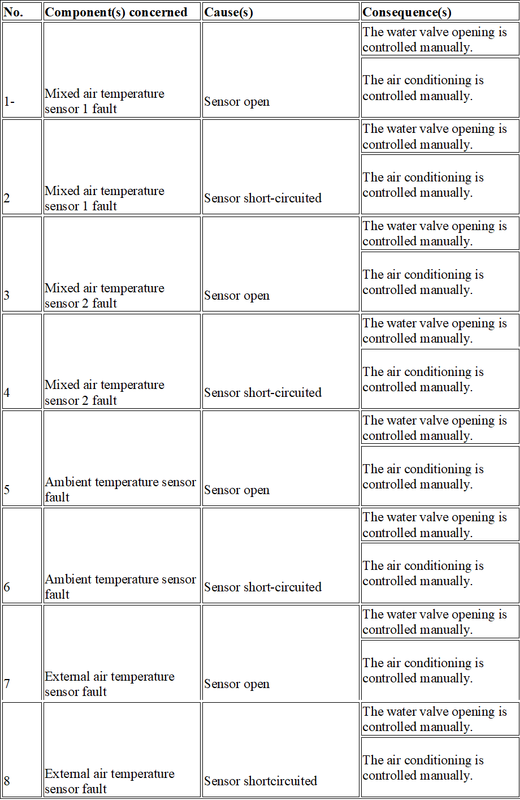 9 Evaporator temperature sensor fault Sensor open The air conditioning is turned off and cooling is not possible. 10 Evaporator temperature sensor fault Sensor shortcircuited The air conditioning is turned off and cooling is not possible. Solar sensor failure The signal from the solar sensor is out- side its limits or is giving an impossible value. The system takes a default value of 300 W/m². Recirculation actuator no. 1 input error The signal from the potentiometer of recirculation actuator no. 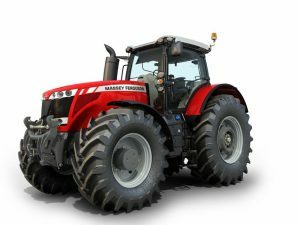 1 is outside its operating range. The recirculation actuator (no. 1 and 2) is automatically set to the “external air” position. 15 Potentiometer recirculation actuator (no. 1 & 2) reference error The potentiometer reference is short circuited to the earth. The recirculation actuator (no. 1 and 2) is automatically set to the “external air” position. The signal is outside its operating range. The system switches to automatic mode at a temperature selected by default (21°C). 17 Input error from fan speed potentiometer The signal is outside its operating range. The system controls the fan speed automatically. 18 Ambient temperature sensor fan fault The fan does not turn. 19 Stepper motor output error (water valve) The stepper motor does not operate correctly. 2) output error The recirculation actuator does not operate correctly. The recirculation actuator motor output (no. 1 and 2) is deactivated. 21 Air conditioning relay output error The relay does not operate correctly. 22 Water pump relay output error The relay does not operate correctly. 23 Fan relay output error The relay does not operate correctly. The CAN message is not valid. The system considers the last value received within 2 seconds. If no CAN message is received during this time, the system takes a default value of 1500 rpm. The CAN message is not valid. If no CAN message is received, the system considers the last value received within 2 seconds (20 consecutive mes- sages). The CAN message is not valid. The system considers the last value received within 10 seconds. If no CAN message is received during this time, the system takes a default value of 90°C. 27 Fan speed controller no. 1 output error The signal is outside its operating range. 28 Failure due to undervoltage The supply signal is lower than the minimum value. The control unit operates in degraded mode. 29 Failure due to overvoltage The supply signal is higher than the maximum value. The control unit is deactivated. 30 Fan speed controller no. 2 output error The signal is outside its operating range. 31 Fan speed controller no. 1 return error The signal is outside its operating range. 32 Fan speed controller no. 2 return error The signal is outside its operating range. Recirculation actuator no. 2 input error The signal from the potentiometer of re- circulation actuator no. 2 is outside its operating range. The recirculation actuator (no. 1 and 2) is automatically set to the “external air” position.